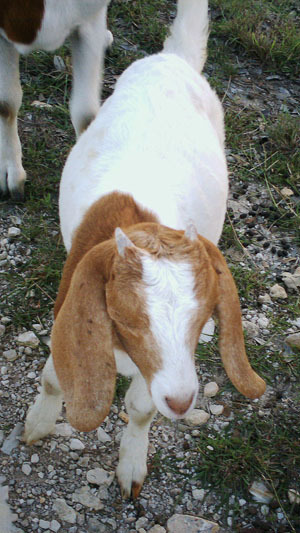 Looking for a goat, for meat, agricultural tax exemption, land clearing, or companionship? We have healthy, gentle goats that are ready for any of those things. Please consider Raven Ranch when you find yourself in need of a goat. All Junior does, wethers, and bucklings are for sale. We're willing to part with our Senior Does and Cyrano for the right price. Call or email us if you wish to buy a goat. Goats are great for the barbeque. 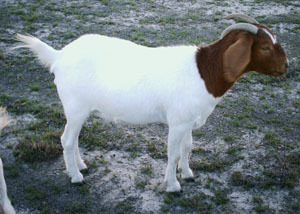 Call or email for more information about our meat goats. We keep our goats ready to eat. They are pasture and hay fed with as little feed as possible. We use medicines and wormers only when necessary for their health and well being. We are not licensed to butcher an animal under the FDA. We will not butcher a goat for you. We will also require you to explain in what manner the goat will be killed and for what function. If we deem the method of killing is inhumane, or the purpose intended harmful to any party, we reserve the right to keep you from taking the goat. We do not deliver goats. You will have to come on site with adequate means to safely transport your goat and prove that you will be able to humanely treat the animal until slaughter or otherwise. We reserve the right to refuse any purchase. We only accept cash up front. We will not sell any goat for cage hunting or for any illegal activity. Cadbury is one of triplets, and had to share an udder under such conditions, but she is fluffy. Even with the summer heat she is fluffy. She also has an incredibly delicate and refined face. In fact, she has the most beautiful face on a goat that we've ever seen. However, she's not just a pretty face. She has a great body to match. Baby Doll was one of triplets. She is a quieter doe then her mother, (by far), and she is respectful and is not easily frightened. She has four working teats on her udder! We currently have no bucks or wethers at this time.